Walt Disney World offers many of us a change of scenery from our everyday offices and commutes. But what if you called Walt Disney World home? Or a specific corner of the resort? Well, then you mosey across the Vacation Kingdom to try something new. I could be talking about a lot of people, but in this instance I’m talking about Santa Claus who calls Winter Summerland home. Going snorkeling at Shark Reef. Clearly Santa Claus, I mean Jaws, has a sense of humor. This is a reference to the Typhoon Lagoon attraction where guests can snorkel with sharks, fish, and other creatures of the deep. While Winter Summerland shares its space and theme with Blizzard Beach, this shows that the tales created by these two parks aren’t exclusionary to the world around them. There are a few crossovers between the two water parks, such as their cousinly mascots, but this is arguably the most direct connection between the two areas of Walt Disney World. 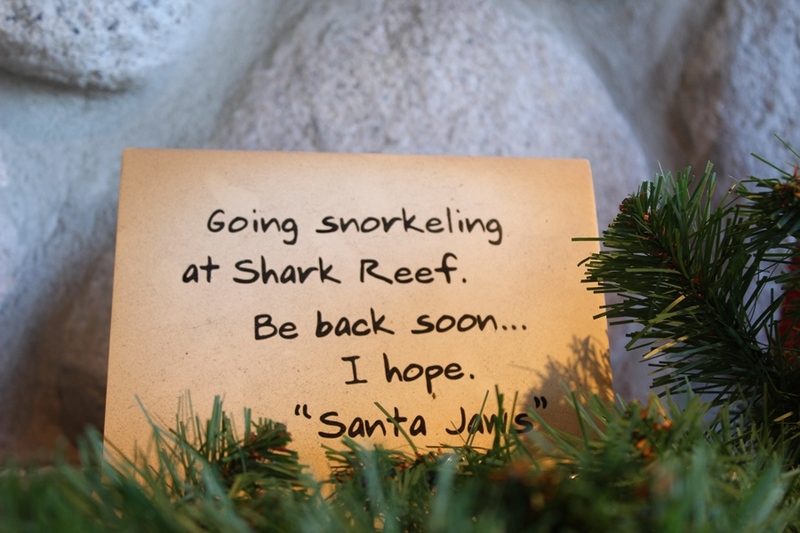 And don’t worry about Santa, I’m sure none of the sharks want to end up on his naughty list!